You want to buy a new grill with the best quality and performance. Weber has some of the best choices for that. Weber’s grills almost never flare up and are very durable. However, choosing between Weber Summit vs Genesis II may be confusing, as they both come with great features. – Which grill model that is more recommended for the money. The decision was easy in the past. Weber Summit was the premium model with higher-grade features, whereas the Genesis line was more affordable. However, Weber Genesis IIhas been released with new modern technologies and features which make it look very attractive. See also: Weber Genesis 310 vs 410. Before we proceed to the differences, let’s first see a few more details that are common between Weber Summit and Weber Genesis II. All of these grills are available in versions that use liquid propane as well as versions that use natural gas. So, you don’t need to worry that the model you choose may be incompatible with the fuel used in your home. Just make sure that you choose the right version. 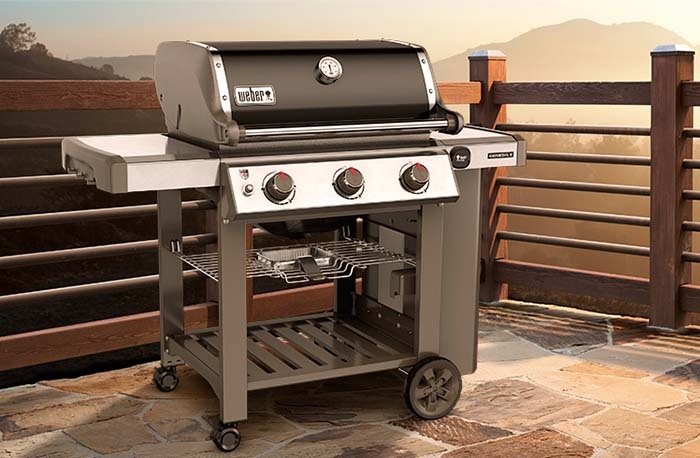 All grills of Weber Summit and Weber Genesis II are also available in stainless steel versions (the S series) and in porcelain-enameled steel versions (the E series). You may choose according to your color preference. A stainless steel version may be easier to clean and maintain, but porcelain-enameled versions look more attractive and come with more color choices. Finally, both Weber Summit vs Genesis II come with several different variants that vary by the size, heating power, and feature set. The equivalent models of the Summit and the Genesis II generally have similar performance. For some time, Weber Summit has been considered as a premium line. The grills that belong to this line come with advanced features and technologies. Let’s take Weber Summit 670 as the example. This six-burner grill is the best grill in the line which comes with loads of features. Some notable ones include the sear station, smoker box, and rotisserie system. The sear station allows you to maximize the heat of the grill without reducing the grilling space. The sear power has high power to increase the heat for searing on demand. A flush-mounted side burner allows you to multi-task while grilling. Meanwhile, the smoker box comes with a dedicated burner. The rotisserie system is perhaps the most attractive feature of all. It has a built-in stow-away motor and two sets of forks. Don’t worry, the cabinet has a dedicated storage space for the spit and forks. It is armed with an infrared rotisserie burner to give the best cooking results. All in all, if you don’t mind spending your money for the best grill, Weber Summit 670 makes the best way to go. 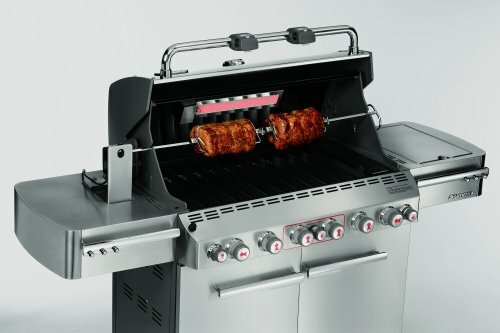 If Weber Summit 670 is too expensive, but you still want to enjoy premium features, Weber Summit 470 can be your choice. This is a more affordable four-burner model that comes with similar features. It is also smaller, so it is great if you don’t have much space available. 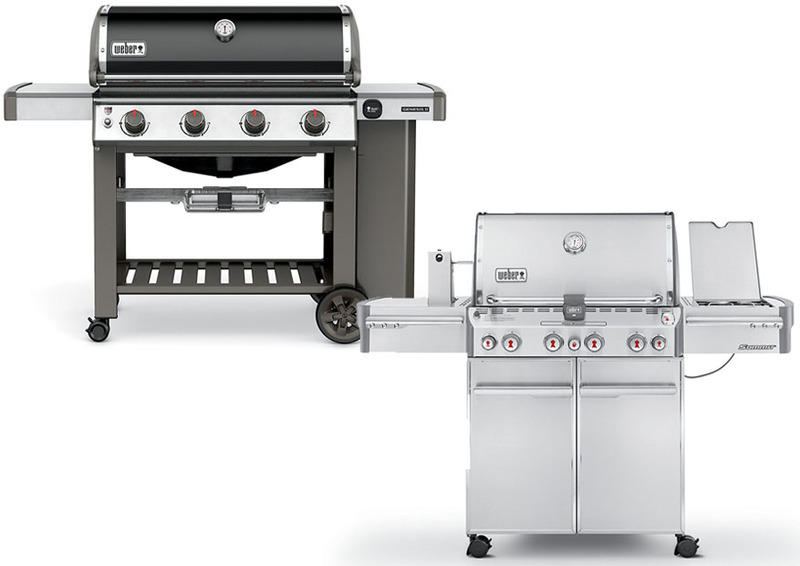 The stripped down models, Weber Summit 620 and Weber Summit 420, do come with more affordable prices. However, they are not recommended at all. They don’t have any sear station, smoker box, or rotisserie system. Why would you buy a stripped premium model that has no additional features? If you prefer to save some money, take a look at Weber Genesis II instead. Weber Genesis II has been released to replace its predecessor, Weber Genesis. There are some notable improvements, including the new GS4 grilling system which has improved ignition, more consistent heating, and improved flavorizer bars. It also has an optional mobile app which allows you to monitor your food remotely – this is very cool, right? Unlike Weber Summit, Weber Genesis II has a wider range of choices. It is available from two-burner models to six-burner models. So, you can find more choices to fit your purpose and size preference. The BTU output also ranges from 26,000 BTU to 72,000 BTU, depending on the model. Take a look at the available models from Weber here! Although Weber Genesis II comes with cool new features, it still serves as a lower line. It does not come with additional features such as a side burner, smoke box, or rotisserie system. There is another line called Weber Genesis II LX. This line is supposed to be the “luxury” version by coming with a side burner, more weather-resistant stainless steel grates, and backlit knobs for night-time grilling. In addition, Weber Genesis II LX generally has 10% higher BTU output than the regular line. Weber Genesis II makes a much better value for the money if you don’t really need a side burner, smoke box, or rotisserie system. It is quite more affordable. Even so, it also offers impressive build quality and performance. The grills are highly durable. They can cook evenly without constant flare-ups. The new grilling system implemented in Weber Genesis II makes it an even better choice. The mobile app is great – it will allow you to monitor your food while you are watering the garden or handling the laundry. Weber Genesis II LX is not as recommended. Although it is considered as the “luxury” version, it does not come with essential features like a smoke box or a rotisserie system. The additional features are rather gimmicky. Do you really need backlit knobs? Probably not. Yet, it is priced almost as high as the Summit line. Between Weber Summit vs Genesis II, we recommend you to choose Weber Genesis II. It offers the best value for the money. It already has similar performance as the more expensive model, while being more affordable. In addition, it has a nice mobile app which allows you to monitor your food remotely. Weber Summit is only great if you need the sear station, smoker box, and rotisserie system.